Whether its Smoked Beef flavoured potato chips during Sunday lunch or the Creamy Cheddar flavour at picnics, whatever the occasion, South Africans have many happy memories of special, family fun times shared with a bag of Simba chips. South Africans were introduced to the Simba Chippie In 1957. 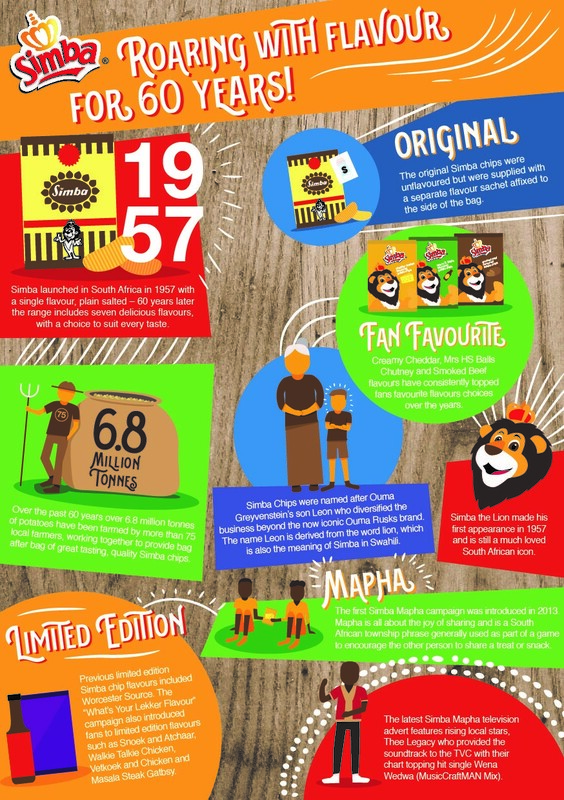 Not only did they get their very own local is lekker chip, it was also an opportunity to sneak a first glimpse of Simba the Lion, who would go on to become one of South Africa’s most recognisable and loved icons. 60 years later, over 6.8 million tonnes of potatoes have been farmed by more than 75 local farmers, working together to provide bag after bag of the great tasting, quality Simba chips that fans, of all ages, have come to expect and enjoy. Simba chips have continuously introduced flavours that appeal to the local palate by partnering with other heritage brands to offer, amongst others, All Gold Tomato Sauce flavour and the popular Mrs H.S Balls Chutney flavoured potato chips. Back in 2010 during the “What’s Your Lekker Flavour” campaign, Simba fans were even introduced, for a limited time period, to the possibility of Snoek and Atchaar, Walkie Talkie Chicken, Vetkoek and Chicken and Masala Steak Gatbsyflavours. Simba chips started with Ouma Greyvenstein, the creator of Ouma’s Rusks. After a chance meeting with the founder of the Lay’s chip brand, her son Leon expanded the family business to include potato chips. Simba the Lion was the company’s way of acknowledging this vision as Leon means Lion as does the word Simba in Swahili. This company has today grown into a snack empire that spans across Southern Africa and has become an important part of the world’s biggest snack and beverage company, PepsiCo. Simba, drew inspiration from the brand’s rich legacy as a social and family sharing brand and in 2013 introduced its first Simba Mapha campaign. Mapha is all about the joy of sharing. It’s a South African township phrase born out of the humour of young kids, generally used to encourage the other person to share a treat or snack. 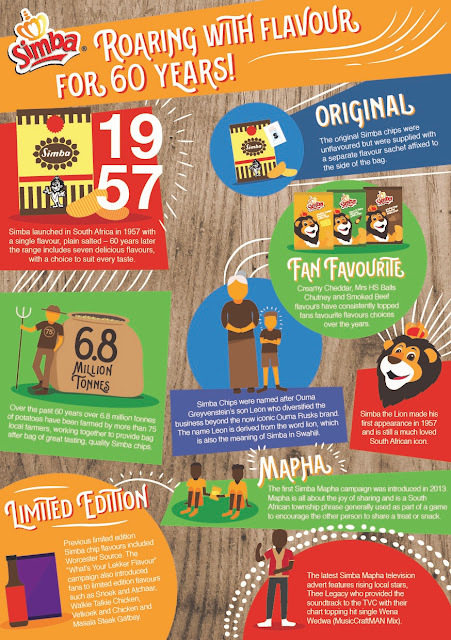 It’s a game that has been enjoyed by generations, which is why it was fitting for Simba, as an iconic South African heritage brand, to bring back the nostalgia with this happy memory. To celebrate 60 years of Simba fun, look on pack for details on how you can claim your share of six million Rand in airtime and have the opportunity to Mapha your good luck with a friend, because with a bag of Simba chips, we know that some things are just better when you Mapha. Family fun times are never complete without a great tasting snack that everyone can enjoy together. Simba has been part of our fun family sharing occasions from way back when and will continue to deliver on its promise for a strong South African taste experience 60 years later.